There are a handful of very cool things going on in space over the next few days. Here’s my very quick run down of what not to miss. The first event is happening in the wee small hours of tomorrow morning. The European Space Agency is launching the ATV, the Automated Transfer Vehicle, atop its Ariane 5 launcher. This is essentially a very large unmanned supply ship that is capable of flying to the International Space Station under its own power. It is going to be launched from the ESA launch site at Europe’s Spaceport in Kourou, French Guiana on Sunday morning at 04:03 GMT. Once the ATV is at the station it will supply the ISS with drinking water, fuel for the station’s propulsion, food for the astronauts, clothing and spare parts for the new Columbus lab. It will also use its engine to boost the ISS into a higher orbit. Something that is very important to do as the ISS continually encounters the drag from the Earth’s atmosphere, causing it to slow and fall closer to Earth. You can read more about the ATV here and also watch the launch live here. 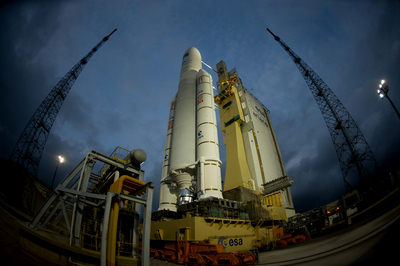 Above: An ESA Ariane 5 with the ATV inside, poised on the launchpad. 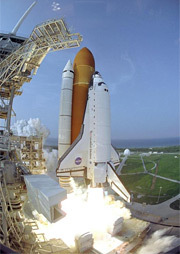 The next Space Shuttle mission, STS-123, is set to lift-off from Cape Canaveral as well at 21:28 GMT on Tuesday 11th March. This is a night-time launch (by my recollection that hasn’t happened for a while) so should look very cool as the shuttle, Endeavour, rises into the inky black darkness. This will be the 25th flight to the ISS and Endeavour will be carrying a robotic system and the Japanese Kibo Logistics Module. You can watch the launch live on NASA TV and find out more about the Space Shuttle at the NASA page. Above: The shuttle Endeavour lifting off on a previous 2007 mission. Credit: NASA/John Kechele, Scott Haun, Tom Farrar. The Cassini orbiter is going to be flying right over Enceladus’ surface on March 12th. Passing by only 50km above the icy moon’s surface we should see some truly incredible science come out of this flyby. Hopefully we will find out more about those jets! Cassini won’t be imaging though, at its closest appraoch, as it will be travelling far too fast not to take blurry pictures. But the pictures from before and after the approach should be amazing. You can get all the updates from the Cassini-Huygens website over at JPL when they are released. Lastly then the Moon passes very close to the Pleiades cluster of stars on Wednesday (12th March); making for a nice early evening view through some bins or a small telescope. Visit the night sky page for more info.